Budget Compromise May Be A Tough Sell In Congress Despite all the excitement over the $38 billion budget deal that averted a government shutdown last week, lawmakers really just reset the clock. Once again, they have until midnight on Friday to wrap up work on the compromise. While it's expected to pass, there's still a lot of grumbling in the GOP caucus. 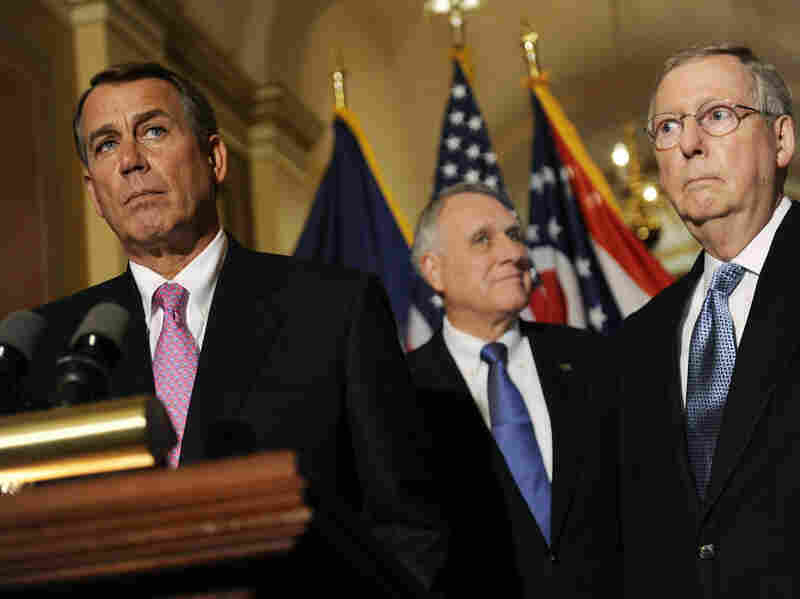 House Speaker John Boehner (from left), with Sen. Jon Kyl (R-AZ) and Senate Minority Leader Mitch McConnell (R-KY), speaks to reporters after meeting with President Obama about the deficit at the U.S. Capitol on Wednesday. President Obama laid out his vision for next year's budget on Wednesday: a plan to cut the deficit by more than $4 trillion over 12 years. Meanwhile, House lawmakers are just getting to the business of wrapping up this year's spending plan. Despite all the excitement over the budget deal that averted a government shutdown last week, lawmakers really just reset the clock; once again, they have until midnight Friday to wrap up work on the compromise. House and Senate leaders expect the bill to pass, but getting it through Congress won't be easy. "What we have before us is a measure that I don't like," said the California Republican. "I don't believe that it does enough to reduce the size and scope and reach of government. I believe that we need to do more, but we have to remember that we have to take that first step." The package tries to carve more than $38 billion from day-to-day operating budgets of government agencies — less than the $61 billion House Republicans originally pushed for, and far more than what Democrats initially offered. But that hasn't quieted the grumbling in the GOP caucus. Some high-profile Republicans have come out against the compromise. Among them, the head of the conservative Republican Study Committee, Ohio Rep. Jim Jordan, and Tea Party favorites Mike Pence of Indiana and Michele Bachmann of Minnesota. Bachmann, speaking last week in Iowa at an event sponsored by an evangelical group, explained why she broke with her party's leadership over the budget bill. "I have to tell you," she said, "I was very disappointed at the bill that came through — and that was an understatement." The problem, says Bachmann, is that the bill doesn't defund the new health care law — nor does it include Pence's provision to bar funding for Planned Parenthood. Majority Whip Kevin McCarthy, the House majority's chief vote counter, says Republicans are focused on spending cuts. He says lawmakers are still reading over the details, but insists the bill will have enough support to pass. "Think for one moment," he said. "In the State of the Union, the president sat out here and said we would freeze spending. Our speaker negotiated, outnumbered 3-to-1 — we have cut spending. We know this is a long road up to that shiny city on the hill, and we just believe we've just [reached] one more peak, and we'll continue to climb." McCarthy wouldn't say whether they'll need Democrats to ensure passage. And so far, only a few, like Rep. Robert Andrews of New Jersey, have committed to it. "I frankly salute both sides for leaving aside extraneous matters like not funding Planned Parenthood and not funding the health care bill. I think this is a worthy compromise," Andrews said. "I'm glad to support it." But liberal Democrats, like Jim McGovern of Massachusetts, are voting against it. "I'm also pleased that the leadership ignored the chants of 'shut it down' coming from the most extreme elements of their party. But I'm not pleased," he said, "with this so-called compromise. This bill cuts the wrong things too deeply and ignores some of the things that could stand to be cut." And lawmakers on both sides of the aisle have criticized some of the cuts as budget gimmicks, in part because some of the savings come from reclaiming leftover money or winding down programs already set to end.